We’re down to 6 candidates! Who do you want nominated? 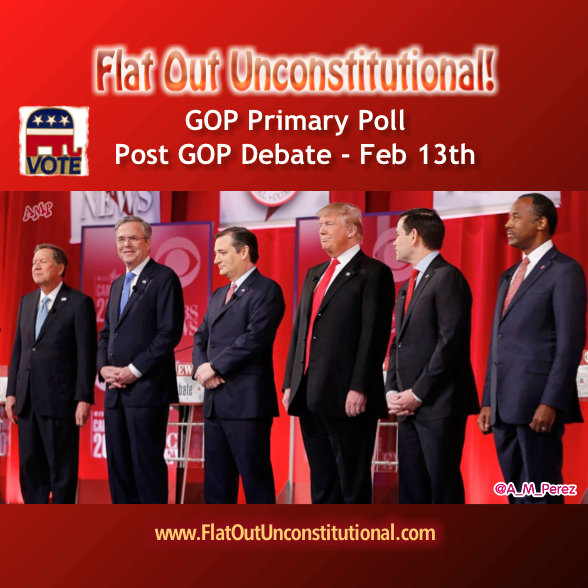 Next GOP Primary Poll – Jeb Out! My vote will be for Trump. I’m fed up with the Dem and Rep parties controlling the population by backstabbing us. If Trump don’t perform then we vote him out. Cruz and Rubio have proved to me they are more of the same. Trump is a man of his word. I ask you from where we are now do you have any doubt he will turn out country around. He will make the middle class a large piece of the pie than we have ever seen ever.